Designed for students of linguistics at the advanced undergraduate or graduate level, this volume is a comprehensive and accessible textbook on syntactic analysis. Working within the "Lexical Functional Grammar" (LFG) approach, it provides students with a framework for analyzing and describing grammatical structure, using extensive examples from European as well as non-European languages. While its primary focus is on syntactic structure, it also covers aspects of meaning, function and word-structure directly relevant to syntax. 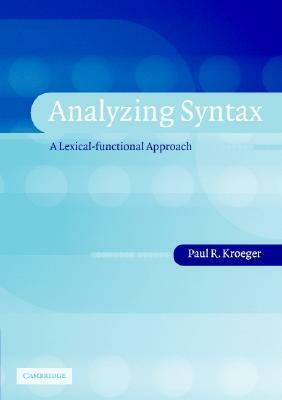 It is ideal for one-semester courses in syntax and grammatical analysis.